It’s Secret Recipe Club reveal day! This month, I was assigned a terrific blog called Edesia’s Notebook. Lesa has a wide variety of great looking recipes…there were so many to choose from! I took a look at her recipe index when I first got my assignment, bookmarked about 5 of them, then had a pretty busy few weeks. We were hit HARD here, as I’m sure most of you know. More devastation than this area has ever seen before from a natural disaster. There is a TON of work to be done to rebuild, many have lost their homes and possessions, and there are still an overwhelming amount of people without power, one week later. There is only so much you can do for others during a time like this. My husband, who is a licensed electrician, has been spending a lot of time at the homes of family and friends, hooking up their generators for maximum usage. It’s what he does well. And me? My contribution was what I do well…feed people. 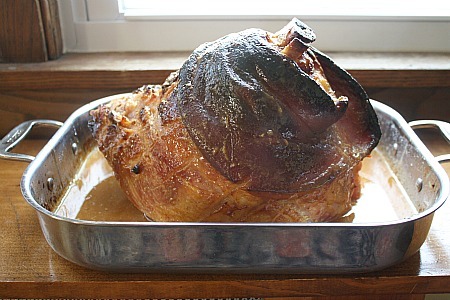 There’s something super comforting about a baked ham. And it feeds a LOT of people. Perfect for a time like this. The glaze was delicious and used ingredients that I had on hand, which was great since the majority of our grocery stores have either been out of power, or low on inventory. We enjoyed some of this ourselves, and I made a great (and easy!) meal with the bone…come back here later in the week to check it out. Score fat (don’t cut into meat) in ham in a diagonal crosshatch pattern. Place in a roasting pan, flat side down. Bake for about 2 1/2 hours (15 minutes per pound). This entry was posted in main dishes, pork, Secret Recipe Club. Bookmark the permalink. Great choice, Melissa! I’m glad you liked the recipe. Hope things get back to normal for you soon. That looks delicious. I’ve made a lot of things, but I’ve never done a ham. I just might, based on your recipe. Thanks for sharing with the SRC. The flavors in the glaze sound perfect, what a wonderful meal. Hope that life returns to normal very soon for you and your neighbors. That sounds so yummy, and what a great meal to serve to people who certainly can use it. I’m so glad to hear you guys are okay!!! 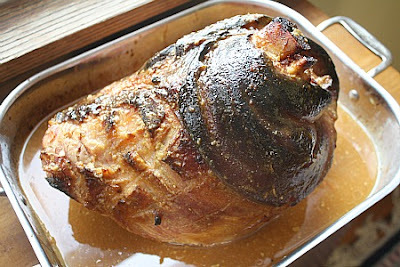 This ham looks perfect to feed a crowd!